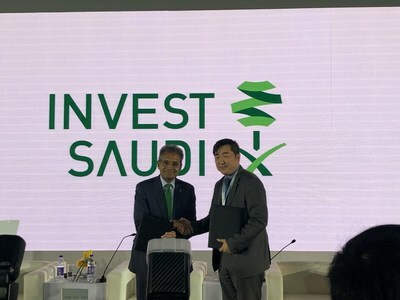 BEIJING, Feb. 25, 2019 /PRNewswire/ — Recently, the executives of ACWA POWER, Saudi Arabia’s leading developer and operator of power and desalination water plant, visited China with HRH Crown Prince of Saudi Arabia, and signed a global cooperation memorandum with Huawei in Sino-Saudi Investment Forum in Beijing on February 22. The two sides will work together to develop global PV market and apply the cutting-edge technologies such as artificial intelligence, big data, and cloud computing to PV plant projects to promote industry progress with technological innovation. Executives including Mohammd Abunayyan, Chairman of ACWA POWER, Paddy Padmanathan, President and CEO of ACWA POWER, Rajit Nanda CIO of ACWA POWER, Dennis Zhang, CEO of Huawei Saudi Company, and Steven Ma, General Manager of Huawei Smart PV Solution MEA, attended the signing ceremony. In fact, ACWA POWER has cooperated with Huawei several times in 2018. On January 17, 2018, ACWA POWER, NOMAC, and Huawei signed a comprehensive procurement agreement on the smart PV management system in the World Future Energy Summit. On December 26, 2018, ACWA POWER and Huawei signed the inverter procurement agreement for the Sakaka 300 MW project in Saudi Arabia, to which the Huawei FusionSolar 1500 V Smart PV Solution is fully applied. Singing the memorandum is the further cooperation between the two sides after jointly developing the Sakaka 300 MW project, the first large ground PV plant in Saudi Arabia. It is conducive to Saudi Arabia’s energy development in compliance with the energy strategic transformation requirements of the country as part of the Kingdom’s Vision 2030 strategy. Khalid Bin Abdul-Aziz Al-Falih, Minister of Energy, Industry and Mineral Resources in Saudi Arabia, said in an interview with the media that energy cooperation has played an important role in Sino-Saudi Arabia relations and that further cooperation between the two countries in the energy field is in the strategic interest of both sides. In the future, Huawei will cooperate with ACWA POWER in the forward-looking technology fields. Through advanced technologies such as smart I-V curve diagnosis, AI algorithm, and big data with AI, Huawei and ACWA POWER will build a simplified PV system, greatly improve the energy yield and O&M efficiency of PV plants, and accelerate the intelligent upgrade of PV energy in the Middle East.